BSX Digital Music blasts off with a collection of the most beloved science fiction themes with SCIENCE FICTION’S FINEST, VOLUME 1. The 36-song collection features newly recorded music from film and TV series including STAR TREK, STARGATE, DOCTOR WHO, DUNE, and BATTLE: LOS ANGELES. 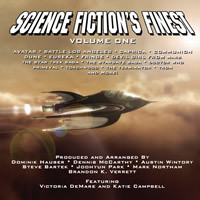 SCIENCE FICTION’S FINEST, VOLUME 1 includes new recordings of music composed by David Arnold, Edwin Astley, Wendy Carlos, Eric Clapton, Brad Fiedel, Murray Gold, Jerry Goldsmith, Joel Goldsmith, Barry Gray, James Horner, Dennis McCarthy, Bear McCreary, Ennio Morricone, Toto, Brian Tyler, John Williams and many others from films such as AVATAR, DUNE, THE TERMINATOR, TRON, John Carpenter's THE THING and popular television series such as CAPRICA, DOCTOR WHO, EUREKA, FRINGE, FUTURAMA, KNIGHT RIDER, TORCHWOOD, ROBOTECH, STAR TREK: DEEP SPACE NINE, STAR TREK: ENTERPRISE, STARGATE: SG-1, STARGATE: ATLANTIS, THUNDERBIRDS, UFO and more. Also included are new recordings of previously unavailable music from COMMUNION, DEVIL GIRL FROM MARS, MAN FROM ATLANTIS, PRIMEVAL, STARGATE: UNIVERSE, THE STARLOST and STAR TREK: THE ANIMATED SERIES. SCIENCE FICTION’S FINEST, VOLUME 1 contains over 78 minutes of music! Cover art is by Tobias Richter of The Light Works (www.thelightworks.com).